Jack was conceived at anchor off Conception Island in the Bahamas. Before he was born he'd clocked up 17 islands as we sailed 2,000 miles from the Bahamas to Grenada. When I was queasy, I drank ginger beer from Jamaica, which had chunks of ginger and sugar in it. I was very tired and had long sleeps each day, so John sailed more or less single-handedly. I stopped lifting and swimming, but did snorkelling to keep fit. Moonshine, our home for two years, in Grenada, and came back to the UK. We expected to return in March with a 4 month old. In September, while I was getting ready for the birth, Moonshine was seriously damaged in Hurricane Ivan. So in November, 10 days after Jack arrived by caesarean, we were off to buy a new yacht. When Jack was 711 months old we moved on to our new boat, Seraphim, and in July 2005 set off again. But this time life was totally different. 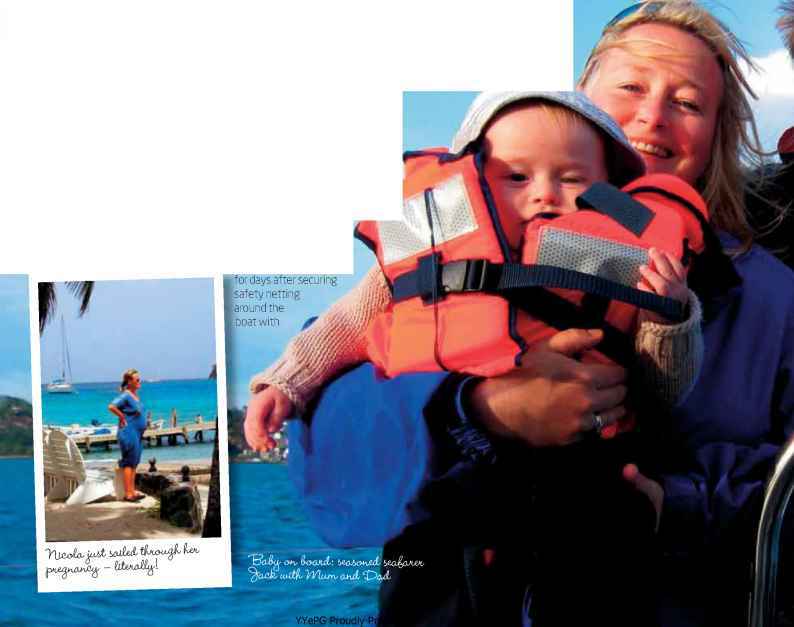 I'd had my reservations about sailing round the world with a baby, but once we were doing it, all our doubts vanished. And we're still at it! We know the 'what-if' scenario inside out, and we're confident in the yacht and in each other. It's law on the boat that Jack's never allowed in the cockpit alone. John's fingers were crooked cable ties. In extreme weather conditions, we pad Jack's cabin with duvets or cushions. We've both done first-aid courses and are armed with several parenting books, such as The Great Portland Street Baby and Childcare Book, What to Expect in the First Year, the Haynes Manual for Baby through to Two Years, and Annabel Karmel's New Complete Baby and Toddler Meal Planner. It turns out that breastfeeding a baby in his bulky life jacket isn't easy! I breastfed until Jack was , sometimes at an angle of 45 degrees! I'd supplemented with formula from his birth, and by the time we left the UK I was using bottled water for his feeds. When my bulk buy of HIPP organic milk ran out, I bought alternatives in French and Spanish supermarkets. I took a Helios Homeopathy basic kit, and extra chamomilla for teething. However, halfway around France, during the eruption of some really mean molars, I bought industrial-strength gel for him. food myself. I use a low-wattage blender to cook up favourites such as nectarine baby rice and red peppers and hummus. At 5 months, Jack had tc a climbing-up-the-companionway (stairs) explorer. Instead of stair gates we have the AJD, the 'anti-Jack device', which is the floor of his travel cot tied around the bottom of the companionway. 'Keep it simple, stupid' (KISS) is our maxim, and so far, the AJD hasn't been scaled. If Jack's on deck, he's secured to the yacht in his life jacket or by a harness. When we have to get into the dinghy, one of us gets in first and the other hands Jack over in his life jacket. We always have a drill of the double, 'Got him? ', 'Got him'. On rainy days, just like at home, imagination and silly games keep Jack entertained. Everyday items also become toys - melamine plates, egg boxes and, top of Jack's list, four kitchen rolls in their plastic cover. 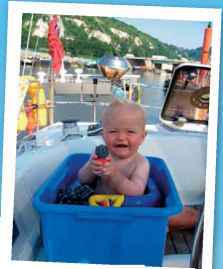 At 8 months, holding onto whatever was at hand, Jack 'cruised' around the yacht. To prevent crushed fingers, doors were closed or hooked open. Thankfully, the cupboards' sea-safe locking device is the perfect deterrent, as long as we remember to push them in, of course! The penalty for forgetting was sugar all over the galley floor and baby sunscreen rubbed into our new carpets. As at home, being at least five paces ahead saves finding your offspring wielding Daddy's hacksaw retrieved from his (supposedly hidden) tool bag, or chomping on lost batteries. Jack usually woke up at 2am and 6am. On night watch we took turns: three hours on, three hours off, three hours on, then cat-napped the next day. Now that Jack is older we've even established a 'naughty spot' in the forward cabin, where he sits for 30 seconds if he's committed a serious misdemeanour like climbing out of the cockpit without his harness. Our journey has, at times, been tough. Early on, John was concentrating on piloting the yacht all day while I was a breastfeeding blubber-ball who missed her mum. 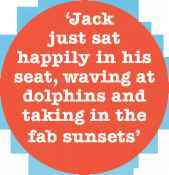 Meanwhile, Jack just sat happily in his seat, waving at dolphins and taking in the fab sunsets. We soon realised that cruising with him is a joy - if we take our time - and that the difficult times have made us closer. In the next four years we hope to sail around the world, returning to the UK when Jack is 5. 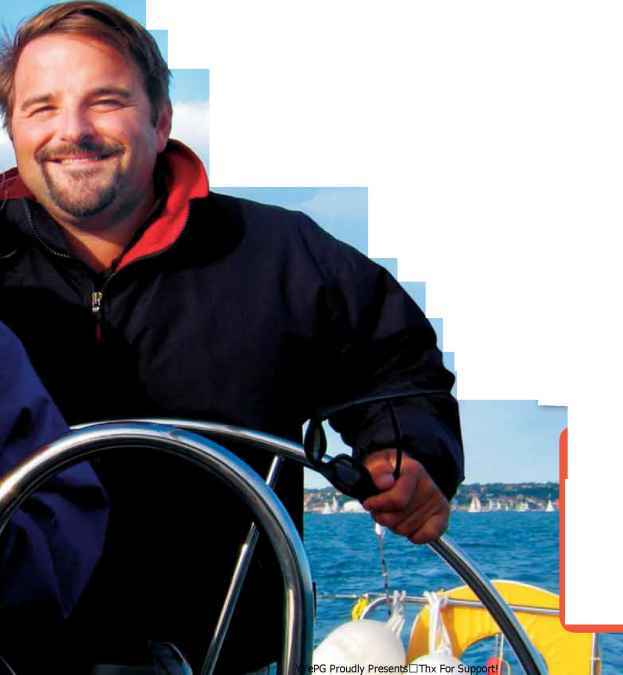 For now, the yacht is Jack's home where he has security, routine and the love of his parents. This extraordinary experience is a gift to us all. • Just do it. Once the decision and commitment is made it's much more straightforward than you'd anticipate. • Wherever you are, keep to your child's routine - it really does help everyone. • Give yourselves time to adapt to your new way of life.